No longer viewed as creepy or a violation of privacy, almost half of consumers will share personal details and opt-in to receive relevant, targeted, personalized communication and information from companies they trust, as long as it is clear why it is in their benefit to do so. This according to a new study by mCordis and Moblico of 1,050 U.S. smartphone and tablet users aged 13-65 is very much in line with past studies on the topic, indicating customers will freely give up their personal info for a better experience. The problem, however, is that despite knowing this, many enterprises are not asking the questions they need to of customers/users and not leveraging their answers correctly when they do. "This survey reveals that people are open to personalization in the app experience and are open to sharing information if they trust the app provider and/or believe that sharing information will lead to a better customer experience”, said Michael Becker, managing partner at mCordis, a mobile advisory and education firm. "Surprisingly, however, just half of respondents indicated that they have been asked to provide some level of personal information by their app providers. This leaves the door wide open for marketers to do a better job." The kinds of information that users are commonly asked for, within apps specifically, are (in order of most asked): name, email address, street address, phone number, gender, age, household size, product or service preference, health or lifestyle preference, contact preference, purchase history and loyalty member number. It's interesting to note that survey respondents said they would definitely, as opposed to maybe, share data with the following types of apps (in order of preference): banking (42 percent), social media (40 percent), retail (34 percent) and so on. The top reason for sharing personal information, according to the survey, is the company providing the app already had the data on file, which could be why users are so willing to share this information with banking and social apps. 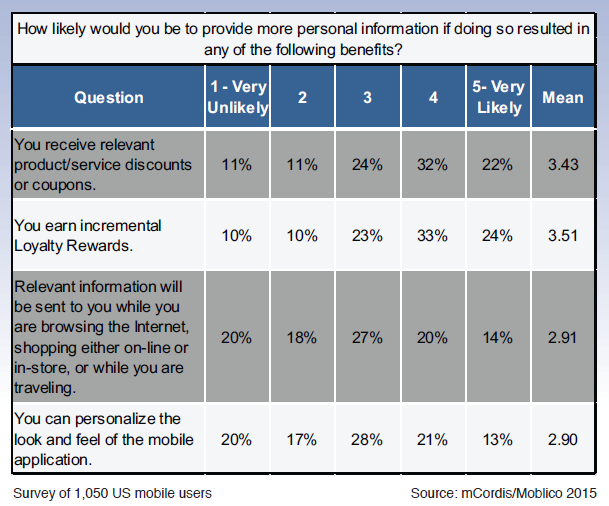 As detailed in the image below, consumers' willingness to share data also depends on what they receive, like discounts.